Located just north of the Canaries, Madeira is quite possibly the Atlantic’s most beautiful island. The scenery is quite spectacular and there are plenty of opportunities to enjoy it during our 4 guided walks. Much of the walking takes place alongside the island’s levadas; man-made water courses originally built to carry water to inaccessible farmland. Visiting some of the finest cliff scenery on Madeira, this walk explores the long thin peninsula at the eastern end of the island. The trail follows São Lourenço Point, the easternmost peninsula of Madeira island, named after the ship sailed by João Gonçalves de Zarco, one of the three discoverers of Madeira, who on coming near this piece of land shouted to his ship “São Lourenço, that’s enough!” We may even be lucky enough to spot the world’s rarest seal, known in Madeira as the ‘sea wolf’. Ribeiro Frio is a place famous for its diverse attractions. Here we can find a beautiful garden, a famous trout pond and the beginning of this wonderful walking trail. This walk in particular, is without a doubt one of the most beautiful in Madeira. You can enjoy the natural heritage of the island, since the trail is full of endemic species of regional flora and fauna. The magnificent vegetation in this peaceful environment fills our eyes and the shining sun infiltrates between the laurels and other plants of this area. 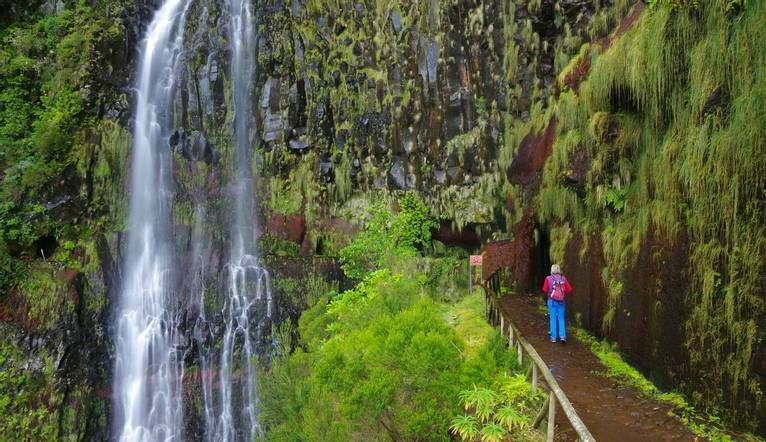 In this walk the hiker goes side by side with the levada that flows slowly along the trail. If we’re lucky we can see a trout swimming along that hides when it feels our presence. Starting at the Queimadas guesthouse and walking along the Levada of Caldeirão Verde, we make our way westwards through an emerald green paradise. Soon after the start we see the most spectacular views of the villages far below. A waterfall comes into view and soon after passing it, we go through some short tunnels and after a while we arrive at Caldeirão Verde, a majestic waterfall. This is a highly recommended walk where we can discover some of the most remote parts of the island. The valley of Rabaçal is one of nature’s greatest celebrations. Descending from the plateau of Paúl da Serra, we arrive at the Rabaçal guesthouse from where we walk to the beautiful Risco waterfall. We then walk to the levada of 25 Fontes and after a while we reach a small lake at the bottom of a cliff which towers above us, from the cliff face, 25 natural springs cascade into the small lake. Walking back we go through a tunnel which takes the water to the south of the island. With direct access to Funchal’s famous Lido Promenade this popular hotel offers superb views over the Atlantic Ocean. It is a conveniently located and is just a 2.5km stroll away from the centre of Funchal or you can catch a public bus from the stop opposite the hotel. Facilities include a restaurant, 2 outdoor heated pools, games room, sauna and health club and Wi-Fi. Room facilities include, balcony, telephone, air conditioning, hair dryer, mini-bar and safe (extra charges may apply). The transfer time from the airport to the hotel is approximately 25 minutes, depending on weather and traffic. Small first aid kit – plasters, insect repellent, etc.